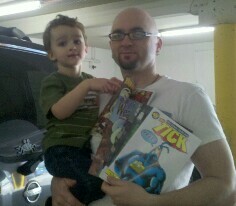 After a lovley Geek Brunch at Brail’s with lots of nerdy talk, Lala and I took Owen to Emerald City Comics to get his free comics. 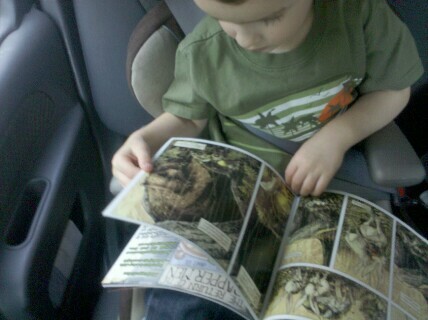 He chose a nice selection; including Spider-Man, Fraggle Rock, and The Tick. The last one was at my suggestion though. Owen couldn’t wait to check them out. I love comics and think they’re a fantistic medium. I’ve read them on and off for most of my life. It all started with a big box of comics my grandfather bought at someone’s yardsale when all of us grandchildren were under 10 years old or so. It had a huge variety of old comics. There were books aimed at little kids: Richie Rich, Little Dot, Archie, Hot Stuff, the Little Devil, Wendy the Good Little Witch, Casper the Friendly Ghost etc. And books aimed at the older kids: Superman, Batman, X-men, Spider-Man, The New Gods, Magnus Robot Fighter, etc. I read every single one many many times. We read them until they fell apart then we ttaped them back together and read them again. I “collected” them for awhile in the early 90s but it was always really about the art and stories for me. I ended up practically giving my collection away when I moved out on my own. Now, I mostly read them in trade paperback collections or online. I hope my boy learns to love them like I did. I’ll be sure to give him plenty of opportunities. This entry was tagged comics, pics. Bookmark the permalink. The Tick is the VERY BEST!! !